This is my second dryer from same G2 family, my first one still works but I want to get the new design. Since I am using CHI hot tools only I am experiencing great hair days always. Taking care of my hair has been awesome with CHI, no worries, no damage but repairs my hair every time I use it. If you need a dryer look no further, this is it.Get it ,use it, love it. Ok, the tech geek in me loves that I can really dial in my settings with the touch screen. It looks and feels solid to boot. It is a solid functional dryer with the oohs and ahhs of a touch screen. I love this dryer so much. I love that it has a touch screen and has very customizable settings. If you can afford to splurge on a dryer I highly suggest this one. I love this hair dryer. I don’t usually spend this much on hair tools (dryer, straighter, etc) especially ones that are digital. I usually think that’s just something else that can break/malfunction. This hair dryer is amazing. I love being able to dial in how hot/warm I want the hair (hotter for straightening and cooler for curls). I also love being able to dial in the air speed. Again a little faster for straightening and a little slower for curls. The attachments attach. It’s no joke! They are on and need a crowbar to get them off. The packaging is really nice. Really nice sturdy box! And it came with some nice sized Chi products. 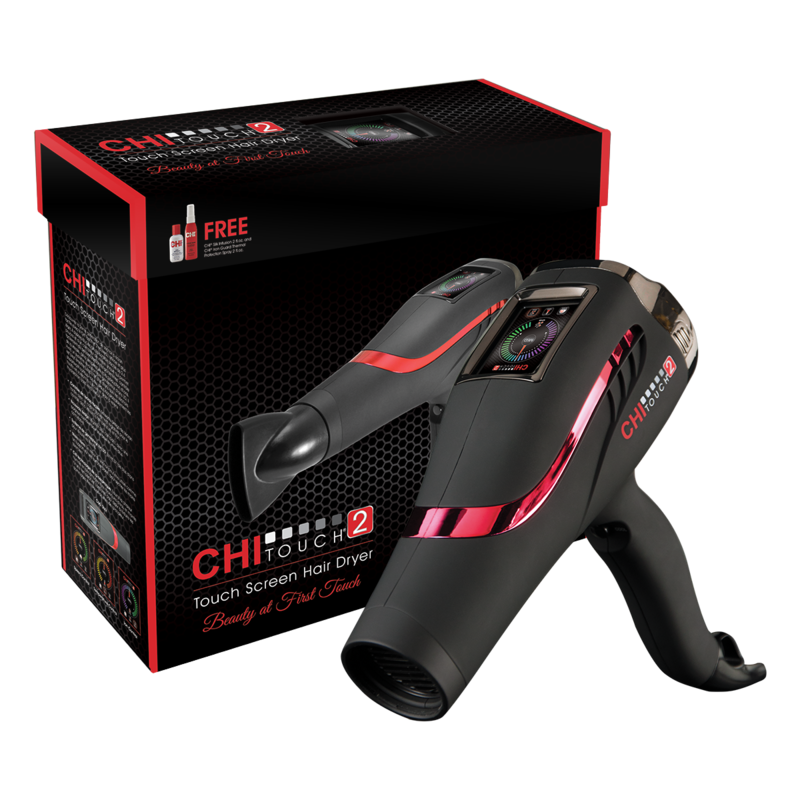 CHI Touch 2 Dryer is worth every single penny and then some! Great for every hair typee even thick, curly hair. Dries your hair in no time while reducing frizz! I absolutely adore this dryer. It keeps my hair from being a frizzy mess, and the controls are definitely nice to use. Didn’t think a hair dryer would be this awesome – great find! This dryer reduces the time by a little, not a lot, but the difference is, my hair is shiny and the fly-always are significantly reduced when I use this dryer. I am amazed by how my hair looks after. It also keeps my hair straighter (I still need to flat iron but it saves me time with flat ironing this way. My hair is also more voluminous. It’s pretty amazing and I don’t think I can go back to cheap dryers. One day I may splurge on the Dyson, but this will do for now. I love the CHI Touch 2 Dryer. I’ve had it for over 2 years and it works just as well as the day I got it. I was a little skeptical about using such a fancy hairdryer. I’ve never spent more than $20 or so for one but this looked cool enough to give it a try. I thought the touch screen was a gimmick, but the amount of control it gives you is far beyond what others allow for temperature, speed, and ions. This is my first hair dryer with ion adjustment, which apparently adjusts to the amount of volume you have. My hair is not very voluminous so I’m not sure what effect it has, but it works FAST. Drying time has been cut from about 8 minutes down to 3, which really adds up when you’re talking about a morning routine. The attachments let you narrow the air stream or diffuse it, which is something I haven’t thought of before since I’ve only had cheap hairdryers that push everything out at once. The narrow airstream is what I mostly use, and it does a good job of cutting a bunch of hair at once to reach all parts. I didn’t even realize until later that the back of the hair dryer is a stand works for hands-free use. What a concept, that will save even more time now that I figured it out. It helps that the device is so light (about 3 pounds), which makes it easier to maneuver. Overall, this is an excellent hairdryer that packs in a bunch of features not found in other products. However, the high price means it’s not for everyone, so check out the features and benefits before buying one. If you’ve only used cheap hairdryers all your life and are considering an upgrade, this model would be a good one to consider. Dries my hair twice as fast as my old dryer. My dry curls appreciate being under the heat for less time. Excellent dryer. Fun to use. Worth the money! Love the adjustable speed settings! Nice blow dryer! Drys hair quickly! I am very happy with my Chi dryer! My drying time is significantly reduced, and overall health of my hair has improved. I highly recommend.